Hydrochemical investigations of groundwater in an urban area of Lome, Togolese Republic were used to evaluate the groundwater quality. The quantities of chemical components (major and some minor elements, temperature, pH, TDS and EC) in groundwater samples were determined and submitted to statistical analysis. The majority of the samples contained high concentrations of Na+ and Cl- (Na-Cl water type). The samples also contained high concentrations of NO3-, which is a serious water quality issue. This NO3- originates from the soil surface and enters the groundwater by infiltration. NO3- and Cl- were the relegate parameter for the drinking use and their content in 78.94% and 63.15% of water samples were greater than 57 mg/L and 260 mg/L respectively. Na+ levels ranging from 37 mg/L to 1430 mg/L. 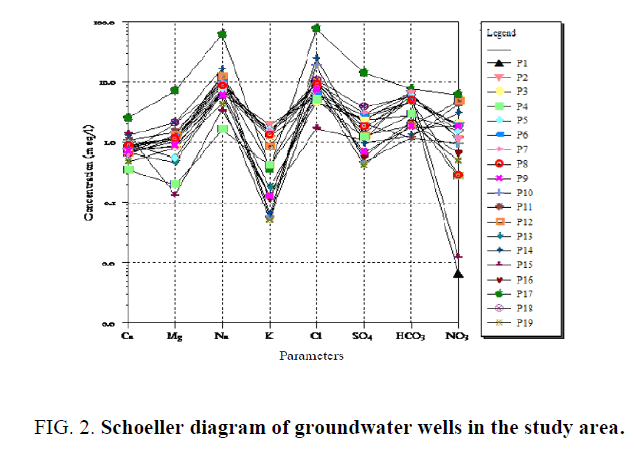 Factor analysis and hierarchical cluster analysis were used to identify the key parameters that describe groundwater quality and cluster the wells into homogeneous zones for future monitoring of groundwater quality, respectively. All water samples analyzed have an EC ranging from 840 μS/cm to 8680 μS/cm which shows saline water. Only P4 was slightly mineralized and have lower EC (334 μS/cm). pH (5.07–7.42) was found to be function of HCO3- concentrations (73.2 mg/L to 463.6 mg/L) in the water. Groundwater is a valuable natural resource for various human activities. Natural water always contains dissolved and suspended substances of organic and mineral origins. However, pollution of groundwater from increased utilization for human needs and increased industrial activity is a major concern . Poor drinking water quality is a public health issue [2-5]. Variations in natural and human activities are reflected in the hydro chemical parameters of the groundwater. Differences in concentrations of dissolved ions in groundwater are generally governed by lithology, groundwater flow, geochemical reactions, solubility of salts and human activities [6,7]. The quality of groundwater for human consumption is dictated by its quantitative and qualitative composition of suspended solids and dissolved minerals or organic compounds . Water quality can be compromised when toxic substances come into contact with the aquifer. This can make the water unsafe for human consumption. The study of groundwater chemistry aims to identify the chemical species in the water and its quality for irrigation and drinking. Drinking water quality can also be monitored using the spatial variation of physicochemical parameters and examine sources by correlating data with the geology and piezometry. Physiochemical data from groundwater can be analyzed using statistical methods such as factor analysis and the hierarchical cluster analysis. Both these techniques can be used to characterize and plan monitoring of the groundwater quality . Factor analysis can be used to determine the structure in the relationships between water quality parameters and identify the most important factors contributing to this structure. Hierarchical cluster analysis is used to reduce the data by grouping them into clusters with similar properties. 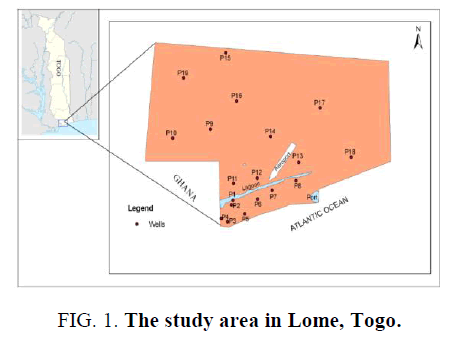 In this study, the groundwater quality around the drinking water supply in urban and suburban areas of Lome, Togolese Republic was evaluated. The study was conducted during the rainy season (July–August 2010) when groundwater recharge occurs. During groundwater recharge surface water, such as rainwater and river water, infiltrates the groundwater and increases contamination. To date, a complete analysis of the region's waters has not been completed. The physicochemical characteristics, including major and minor chemical elements were determined and analyzed by factor analysis and hierarchical cluster analysis. The results aid understanding of the process of mineralization of groundwater in this area and could be used for future planning and implementation of groundwater quality control. The city of Lome, Togo (Figure 1) is an urban area. Lome has two rainy seasons, which are from April–July and early September–late November. However, the rainfall is relatively low (800 mm per year) for the latitude of the city. The climate is stabilized by the ocean and sea breezes and the average maximum and minimum temperatures are 30°C and 23°C, respectively. The study area was located between the latitudes 6°15'33.00" and 6°6'48.83"N and the longitudes 1°08'30.72" and 1°17'36.82"E. It covered an area of 333 km2 and included a 30 km2 lagoon. Figure 1: The study area in Lome, Togo. Samples were collected from 19 borehole wells, which were selected to provide a uniform distribution over most the drinking water supply area. The wells were between 9 m to 70 m deep. The geographic coordinates of the wells have been obtained using a GPS and used to create a distribution map of wells using ArcGis 9.2 software. Water samples were collected. Physico-chemical parameters, including temperature, pH, electrical conductivity (EC) and Total Dissolved Solid (TDS), were conducted in the field. Other samples were transported to the University of Lome, Water Chemistry Laboratory for testing. Major components (HCO3-, Cl-, S042-, NO3-, Ca2+, Mg2+, NH4+, Na+ and K+), iron and manganese were measured in laboratory within 10 days of sampling. Samples were stored in the dark in a cold room at 4°C. Analysis was carried out according to established methods as follows: volumetric analysis for HCO3-, molecular spectroscopy for NO3-, SO42-, NH4+, Mn2+ and Fetot; atomic absorption spectroscopy for Na+ and K+; complexometric EDTA titration for Ca2+ and Mg2+. The analytical methods were based mainly on the normalized AFNOR  methods. The results were analyzed using a Schoeller diagram created using AquaChem 5.1, which is a software package developed specifically for graphical and numerical analysis and modeling of water quality data . All the data were statistically analyzed by factor analysis and hierarchical cluster analysis. Before analysis, the data were normalized to a distribution with a mean of zero and standard deviation of one. Factor extraction was performed using principal component analysis. Three factors with eigenvalues above one were retained following the Kaiser criterion . They represented 85.426% of the total variance. Varimax rotation was applied to these factors. Table 1 gives the eigenvalues of the three factors and the percentage of variance that they explain. Table 1: Eigenvalues and variance of the factors. The hydrogeochemical results for the study area are presented in Table 2 and Table 3. Table 2: Results for groundwater obtained in the rainy season in Lome, Togo. All units are in mg/L, except for electrical conductivity (EC, µS/cm). The temperature of the groundwater varied by up to 6°C between sample sites and the minimum and maximum temperatures were 25°C (P1 and P5) and 31°C (P12), respectively. Approximately 42.10% of the wells were slightly basic (>7.0) and 57.89% were slightly acidic (<7.0). Twelve of these wells (63.15%) were nearly neutral (6.5-7.5). The acidity of the water in study area is mainly related to CO2 in the soil surface layers, which is produced by biological activities or due to infiltration of precipitation. No data of well depth are available, we just know the rang of well depth (about 9 m-70 m). (The water samples were taken below the surface water of the well). The EC results for the wells ranged from 334 μS.cm-1–8680 μS.cm-1. The World Health Organization (WHO) standard for EC for drinking water is between 500 μS.cm-1 and 1500 μs.cm-1 . However, only 5.26% of the wells had EC<500 μS.cm-1, an additional 5.26% could be classed as moderately mineralized (EC=500 μS.cm-1–1000 μS.cm-1) and 36.84% as highly mineralized (EC=1000–1500 μS.cm-1). Many of the wells (52.63%) could be classed as excessively mineralized (EC>1500 μS.cm-1). The high EC (8680 μS.cm-1) in well P17 could be caused by infiltration of wastewater from nearby septic tanks and landfill into the groundwater. Correlation coefficients were calculated between EC and each of the ions as follows (ion, r): Na+, 0.993; Mg2+, 0.981; Cl-, 0.981; SO42-, 0.919; Ca2+, 0.894; NO3-, 0.711; HCO3-, 0.329; and K+, 0.11. These correlation coefficients show that the EC is strongly influenced by Na+, Cl-, Mg2+ and SO42- and to a lesser extent by Ca2+. The influence of NO3- on EC is only moderate and HCO3- and K+ have little influence on EC. The most abundant cation in the groundwater was Na+, which was at levels ranging from 37 mg/L–1430 mg/L. This was followed by Mg2+ (1.6 mg/L–86.7 mg/L), Ca2+ (7 mg/L–51.2 mg/L) and K+ (2 mg/L–77 mg/L). At levels of <0.336 mg/L (NH4+) and <0.08 mg/L (Mn2+), NH4+ and Mn2+ were well below the WHO standards of 1.5 mg/L (NH4+) and 0.05 mg/L (Mn2+) for drinking water. All concentrations of Ca2+, Mg2+ and K+ in the water samples were within the permissible limits for drinking water. The dominant anion in the groundwater was Cl- (60.06 mg/L–2682.94 mg/L). Over half of the wells (63.15%) had chloride levels exceeding the WHO standard for drinking water (250 mg/L). The source of Cl- is probably marine infiltration and it may also originate from human waste, particularly urine and some cleaning products. The groundwater concentration ranges for HCO3-, SO42- and NO3- were 73.2 mg/L–463.6 mg/L, 20 mg/L–676.5 mg/L and 0.4 mg/L –377 mg/L, respectively. The NO3- concentrations were critical (higher than the standard of drinking water) at some locations (Table 3) and 73.68% of the wells sampled had levels above the WHO standard (50 mg/L). I am referring to NO3 and 50 mg/L is a drinking water standard for NO3. Table 3: Localities with critical levels of nitrate. The high nitrate levels are a concern because they could be involved in transformation of hemoglobin to methemoglobin. Nitrate can be reduced to nitrite, which can oxidize the hemoglobin iron from the ferrous to ferric state. This forms methemoglobin, which is unable to bind oxygen to carry to tissues. Depending on the proportion of methemoglobin, this can lead to various symptoms including mild cyanosis, reduced level of consciousness and death. Because of these serious consequences, water with high nitrate levels must be treated before human consumption. A Schoeller diagram (Figure 2) was used to compare the different wells and highlight the dominant anions and cations in each well. This showed the groundwater in the study area was characterized by abundant Na+, Mg2+, HCO-3, Cl-, SO42- and NO3-. The Schoeller diagram also illustrated the impact of well location on water quality and samples from different wells clearly had different dominant chemical species. The diagrams illustrate that most of these wells contained high levels of nitrate, which as discussed above is a serious water quality issue. The peaks in the Schoeller diagram indicate the water type. In this case, the ground water samples mainly contained predominantly Na+ and Cl- (Na-Cl type) or Na+, Cl- and HCO3- (Na-HCO3 type). Figure 2: Schoeller diagram of groundwater wells in the study area. The factor loadings of the variables (Table 4) reflect their correlation with the extracted factors. The first factor (F1), which contains EC, TDS, Mg2+, Ca2+, SO42- and NO3-, explained 57.391% of the total variance and reflects the mineralization of groundwater. Factor 1 is strongly determined by the Cl- concentration, which could originate from the intrusion of salt water. The correlation between Cl- and Na+ showed that the Cl- is largely present in the form of NaCl. NO3- is naturally present in groundwater at very low concentrations and its source is human activities such as domestic or industrial waste or agricultural. Consequently, F1 reflects also the anthropogenic impact of domestic sewage, industrial waste, uncontrolled landfill waste, fertilizers and manure on the study area. The correlation between Mg2+, Na+ and NO3- showed that NO3- is present largely in the form of salts with Mg2+ and Na+. The second factor (F2) contains the variables HCO3- and pH and explains 18.373% of the total variance. The variables contained in F2 reflect the dependence of the pH on HCO3- concentrations in the water samples. The third factor (F3) explained 9.661% of the total variance and contained only Na+, which emphasizes the importance of Na+ in the water samples analyzed. These three factors accounted for 80.27% of the variability of groundwater quality. Their parameters include HCO3- (F1), SO42-+ NO3-+ Cl-+ Mg2+, Ca2+, EC and TDS (F2), Na+ (F3). However, measurement of only three parameters (HCO3-, NO3- and EC) is sufficient for regular monitoring of the quality of well water. The other parameters can be determined by simple linear regression, because of their correlation to these three parameters. The groundwater wells were grouped into three clusters (C1, C2 and C3) with similar parameters using hierarchical cluster analysis (Figure 3). C1 included wells P1, P8, P2, P5, P6, P12, P7, P18, P10, P11 and P14, C2 included wells P3, P13, P16, P15, P14, P4 and P9 and C3 only contained well P17. It is clear from Table 2 that all wells in each group display the same similarity. This applies, for example the particularity of well P17 who find itself alone in group C3 and is characterized by the highest concentrations of all compounds in all water samples. This classification reduces the number of sampling sites that would be required in any future studies. Figure 3: Hierarchical cluster analysis dendrogram obtained using Ward’s method. Groundwater in the study area was found to be very saline (Na-Cl water type) and highly polluted with nitrate. Consequently, this water is inappropriate for human consumption and must be treated first. The source of nitrate in a contaminated aquifer is critical for managing surface operations to prevent future contamination and for evaluating exposure of human populations to nitrate. Stable isotope compositions of nitrogen and oxygen in nitrate dissolved in the groundwater could be used to determine its origin. The variability in the quality of the depended on three factors: alkalinity (HCO3-), the impact of human activities (domestic or industrial discharge) and salinity. Hierarchical cluster analysis grouped the wells into three clusters. This knowledge could allow future groundwater quality control studies to be performed using a reduced number of measurements on a small number of sampling points. This work was supported by the 863 Program (Grant No. 2007AA06A410) of the Chinese Ministry of Science and Technology and the Studies of Safety Evaluation and Pollution Prevention Technology and Demonstration for Groundwater Resources in Beijing (Grant No. D07050601510000). The analytical data reported were supplied by the Laboratory of Water Resources & Environmental Engineering of the China University of Geosciences (Beijing) and Water Chemistry Laboratory of University of Lome. Foster SSD. Groundwater for development – An overview of quality constraints. In: Nash H, GJH Mc Call, editors. Groundwater Quality. 17th Special Report, London United: Chapman and Hall. 1995;1-3. Organisation Mondiale de la Santé Eau potable et assainissement; 1981-1990. Contribution de l’OMS à la Décennie Internationale de l’Eau et de l’Assainissement. 1981;pp:36. Edmunds A. Groundwater chemistry and development. In: Nash H, GJH Mc Call, editors. Groundwater Quality. Chapman and Hall. UK.1994;pp:5-7. Organisation Mondiale de la Santé. célébration de la décennie internationale d’action l’eau, source de vie (2005-2015). Guide de sensibilisation 2005;pp:34. World Health Organization. Guidelines for drinking-water quality [electronic resource]: Incorporating first addendum. Recommendations. 3rd ed. 2006;pp:595. Bhatt KB, Salakani S. Hydrogeochemistry of the upper Ganges River, India. J Geol Soc. 1996;48:171-82. Karanth KB. Groundwater assessment, development and management. Tata McGraw-Hill Publishers, New Delhi. 1997. Jain P, Sharma JD, Sohu D, et al. Chemical analysis of drinking water of villages of Sanganer Tehsil, Jaipur District. Int J Environ Sci Tech. 2005;pp:373-9. Zeng X, Rasmussen TC. Multivariate statistical characterization of water quality in lake Lanier, Georgia, USA. J Environ Qual. 2005;34:1980-91. AFNOR Eaux, méthodes d’essai. Afnor. 1996;pp:624. Waterloo Hydrogeologic Inc., AquaChem v.5.1 User’s Manual. 2009. Kaiser HF. The varimax criterion for analytic rotation in factor analysis. Pyrometrical. 1958;23:87-200. Rodier J. Water analysis: Natural water, waste water, seawater (The analysis of natural water, waste water, sea water). Dunod techniques. 8th édn. 1996;pp:1384.